Patrick James "Pat" Riley (born March 20, 1945) is an American professional basketball executive, and a former coach and player in the National Basketball Association (NBA). He has been the team president of the Miami Heat since 1995 and head coach in two separate tenures (1995 through 2003, and 2005 through 2008). Widely regarded as one of the greatest NBA coaches of all time, Riley has served as the head coach of five championship teams, four with the Los Angeles Lakers and one with the Heat. He was named NBA Coach of the Year three times (1989–90, 1992–93 and 1996–97, as head coach of the Lakers, New York Knicks and Heat, respectively). He was head coach of an NBA All-Star Game team nine times: eight times with the Western Conference team (1982, 1983, 1985–1990, all as head coach of the Lakers) and once with the Eastern team (1993, as head coach of the Knicks). In 1996 he was named one of the 10 Greatest Coaches in the NBA history. As a player, he played for the Lakers' championship team in 1972. 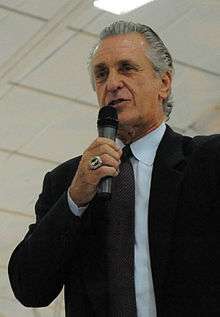 Riley most recently won the 2012 and 2013 NBA championships with the Heat as their team president. He is the first North American sports figure to win a championship as a player, coach (both assistant and head), and executive. He received the Chuck Daly Lifetime Achievement Award from the NBA Coaches Association on June 20, 2012. Riley was born in Rome, New York, and raised in Schenectady. His father, Leon Riley, played twenty-two seasons of minor league baseball as an outfielder and first baseman, and appeared in four games for the 1944 Philadelphia Phillies. One of Riley's most famous moments came when he guaranteed the crowd a repeat championship during the Lakers' championship parade in downtown Los Angeles (he first made the guarantee during the post-victory locker room celebration). While the 1988 Lakers did not produce as many wins in the regular season as the 1987 Lakers, they still won the NBA title, becoming the first team in 19 years to repeat as champions. The Lakers beat the Detroit Pistons in seven games in the 1988 NBA Finals, making good on Riley's promise. Riley's titles with the Lakers make him the fifth man to play for an NBA Championship team and later coach the same NBA team to a championship; the others are Bill Russell, Tom Heinsohn, K. C. Jones and Billy Cunningham. After stepping down, Riley accepted a job as a television commentator for NBC. However, this job only lasted one year, and he became head coach of the New York Knicks starting with the 1991–92 season. Commentators admired Riley's ability to work with the physical, deliberate Knicks, adapting from his style with the fast-paced Laker teams in the 1980s. The Chicago Bulls had easily swept the Knicks in 1991 en route to their first championship. However, in 1992 with Riley, the Knicks pushed the defending championship Bulls to seven games in the Eastern Conference semifinals. The physical defense of the Knicks against the Chicago Bulls' finesse superstars Michael Jordan and Scottie Pippen during the 1992 playoffs led to a feud between Riley and Bulls head coach Phil Jackson regarding the officiating and the Knicks' rough style of play. In 1993, Riley led the Knicks to their best regular season record in team history (tied with the 1969–1970 team) and received his second Coach of the Year award. The Knicks met the Bulls in the playoffs at the Eastern Conference finals where they lost in six games. Ironically, Jackson's Bulls went on to win the finals and accomplish the first "three-peat" in 1993, despite Riley's trademark in 1989. Riley returned to the NBA Finals in 1994, en route defeating the three-time defending champions Bulls (without Michael Jordan) in seven games during the Eastern Conference semi-finals. However his Knicks lost in seven games to the Houston Rockets after being up 3–2 in the series. During the 1994 Finals, Riley became the first coach to participate NBA Finals Game 7 with two different teams, having been with the Lakers in 1984 and 1988. However, he had the unfortunate distinction of having become the first (and to date, the only) coach to lose an NBA Finals Game 7 with two different teams, having lost to the Celtics in 1984. It also denied him the distinction of becoming the first coach to win a Game 7 NBA Finals on two different teams, having defeated the Pistons in 1988. In 1995, Riley resigned from the Knicks via fax to become the head coach and team president of the Miami Heat. The move caused some controversy, as the Heat were accused by the Knicks of tampering by pursuing Riley while he still had a year remaining on his contract with the Knicks. The matter was settled after the Heat sent their 1996 first-round pick (which the Knicks would use to draft Walter McCarty) and $1 million in cash to the Knicks on September 1, 1995. Riley's coaching of the Heat to playoff contention would later make them bitter rivals with his former team. In 1995–96, Riley led the Heat to a 10-game turnaround to finish 42-40. Miami was swept in the first round of the playoffs by the Phil Jackson-coached Chicago Bulls, who had completed the regular season with a record 72 wins. This season was most notable for the ongoing housecleaning that took place, with the arrival of building blocks Alonzo Mourning and Tim Hardaway. The off-season would also bring them Nets forward P.J. Brown and Suns swingman Dan Majerle. The Heat would compile consecutive seasons over .600. However, the 1998, 1999, and 2000 playoffs would be disappointments as they lost to the arch-rival Knicks; the first two in the opening round and the latter in the second round. In 1999, the Knicks themselves reached the Finals. Riley then traded Brown and Jamal Mashburn in exchange for Eddie Jones in one trade and acquired Brian Grant in another, although the team suffered a major setback after discovering Alonzo Mourning's kidney condition. After finishing 50–32 in the 2000–01 season, the Heat were swept by the Charlotte Hornets in the first round of the NBA playoffs. The Heat then lost two of their best players when guard Tim Hardaway was traded to the Dallas Mavericks and Anthony Mason signed with the Milwaukee Bucks. In part because of these departures, the Heat finished 36–46 in 2002. Riley was so disgusted with the Heat's performance that he declared he was about to "fire himself". After finishing the 2002–03 season 25-57, to fully dedicate his attention to his duties as general manager, Riley stepped down as head coach and was succeeded by longtime assistant Stan Van Gundy. Van Gundy and rookie Dwyane Wade, whom Riley drafted 5th overall, led the Heat back into the playoffs with a 42–40 record after starting 0–7. Riley concentrated on improving the team even further before the 2004–2005 season. One of his biggest moves as full-time general manager was to trade Caron Butler, Brian Grant, Lamar Odom and a first-round draft pick to the Lakers for Shaquille O'Neal. O'Neal had just come off a successful stint with the Phil Jackson-coached Lakers winning three straight championships 2000–02 and a 2004 Finals loss. By this time, Riley and Jackson's feud had cooled. Wade and O'Neal led the Heat to the Eastern Conference finals during the 2005 playoffs, although they lost to the defending champions Detroit Pistons after being up 3–2 in the series. Wade had missed game 6 entirely due to injury. During the 2005 off-season, it was widely speculated that Pat Riley was attempting to run Van Gundy out of his coaching job and take over the job himself, now that the team was in a position to contend for the championship. Indeed, Van Gundy would resign from his position as head coach on December 12, 2005, just 21 games into the season, citing a need to spend more time with his family, and Riley resumed coaching the Heat. Riley's Heat team defeated his Los Angeles Lakers-days nemesis, the Detroit Pistons, in the 2006 Eastern Conference Finals on June 2, 2006, making it the first time the Miami Heat reached the finals. Riley's Heat squared off against the Dallas Mavericks in the 2006 NBA Finals. Despite losing the first two games to Dallas, the Heat rallied to win the next four games and their first NBA Championship. After Game Six, Riley commented that he had packed one suit, one shirt and one tie for the trip to Dallas. It was Riley's fifth championship as a head coach, and his first with a team other than the Lakers. Riley became one of only two NBA coaches to take three different teams to the NBA Finals, the other being Alex Hannum. He joined Hannum and Phil Jackson as the only head coaches to lead two different teams to NBA titles. He also became the only coach to twice replace a coach in mid-season and take that team to an NBA title. Citing "hip and knee problems", Riley took a leave of absence from coaching from January 3, 2007, through February 19, 2007. Assistant coach Ron Rothstein assumed interim duties. The Heat finished the season 44–38 and were swept out of the first round of the playoffs by the Chicago Bulls; the first defending champions to be swept in the first round since 1957. The following season, the Heat finished 15–67. The team had lost most of its players to extended injuries, and a disgruntled Shaquille O'Neal was traded mid-season. Two years after leading the Heat to the championship, they now finished with one of the worst records of all-time. On April 28, 2008, Riley announced that he would step down as coach of the Heat. Former Heat assistant Erik Spoelstra was announced as his replacement. Riley remains team president. As president, Riley acquired LeBron James and Chris Bosh to form the Heat's "Big 3" with Dwyane Wade. In 2012, the Miami Heat beat the Oklahoma City Thunder to give Riley his first championship purely as an executive. The Heat repeated the feat in 2013, defeating the San Antonio Spurs. Outside of basketball, Riley has developed into a pop-culture figure. This is born out of Riley's signature look, a slicked-back hairstyle, which is often described as gangster-or mafioso-like, and his immaculate tan. He came to the public eye leading the Showtime Lakers of the 1980s, furthering his image by "guaranteeing" a championship. Riley has coached in three American cities well known for popular nightlife and celebrity culture. ↑ Schenectady City School District Athletic Hall of Fame and Reunion Dinner. Schenectady.k12.ny.us. Retrieved on 2012-08-28. ↑ Kentucky Greats: #18, Pat Riley « UKmadness. Ukmadness.wordpress.com (2008-03-13). Retrieved on 2012-08-28. ↑ Pat Riley Statistics. Basketball-reference.com. Retrieved on 2012-08-28. ↑ "Riley and Jackson through the years". Sports.espn.go.com. 2010-02-01. Retrieved 2016-10-02. ↑ "Riley and Jackson through the years". ESPN.com. February 1, 2010. Archived from the original on June 19, 2014. ↑ Powell, Shaun (1995-07-24). "The Knicks' tamper tantrums are heating up". The Sporting News. Retrieved 2007-04-21. ↑ "No Wade... No Way". NBA.com. Retrieved 2016-10-02. ↑ "Heat coach Van Gundy resigns; Riley returns". sports.espn.go.com. Retrieved October 23, 2015. ↑ Marc Stein (2012-06-20). "Pat Riley: The Miami Years". ESPN. ↑ "NBA Finals Results". SportingNews.com. Retrieved 2007-04-21. ↑ "Bulls Sweep 2006 Champions". NBA.com. 2007-04-30. Retrieved 2016-10-02. ↑ "NBA Regular Season: Worst 50 Teams in NBA History". Landofbasketball.com. Retrieved 2016-10-02. ↑ Riley Steps Down, Spoelstra Named Head Coach, NBA, April 28, 2008, accessed April 28, 2008. ↑ Pat Riley: Just Catholic, Not Quitting. Nba.fanhouse.com (2008-01-10). Retrieved on 2012-08-28. 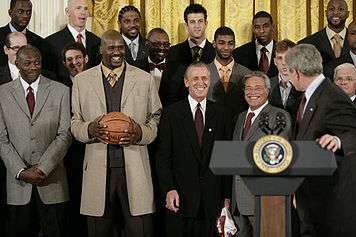 ↑ "President Bush Welcomes the 2006 NBA Champion Miami Heat to the White House". whitehouse.gov. 2007-02-27. 1 2 3 "Pat Riley Statistics". Basketball-Reference.com. Retrieved 2007-04-21.